RALLY COMP is a multi-function race management and metering device and software infrastructure for competitive motorsports and rally-raid events. Based on year's of development by professional rally racers, RALLY COMP's 3 proprietary software and hardware architectures work together to comprise the most comprehensive safety, compliance and event management platform in the most compact size and weight. I. warning racers of upcoming hazards on the course such as ditches, triple hazards, washouts and blind ruts. II. When lost, racers can open Masked Way Points (WPM) and an arrow pointer and will appear on the screen with the distance remaining back to the proper course. III. Rally organizers and officials can use RALLY COMP's RC Trackit send and receive custom text messages directly to and from each racers devices using Iridiums satellite network. ​I. Recording racer's speed within all marked speed limit (DZ-FZ) zones and accesses speeding penalties in real time. II. Recording every Masked Way Point (WPM) cleared by competitors in real time. III. Recording penalties for WPM's opened, skipped or missed. 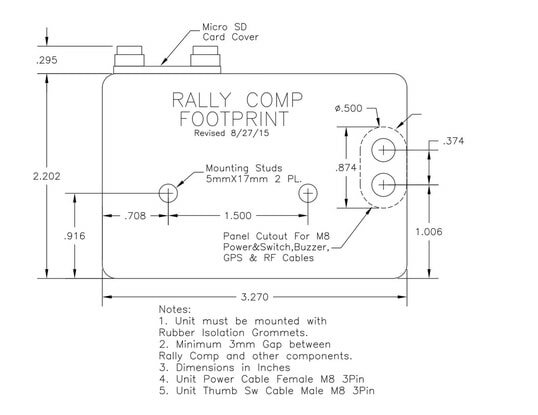 Similar to larger, more cumbersome devices and platforms, RALLY COMP performs virtually all of the same functions at a significantly more efficient manner in terms of size, weight and cost. I. RALLY COMP guides racers from the bivouac to an exact point of staging area for each Special Stage departure area. III. Waypoint and Speeding violations are recorded in real-time and adjust the competitors total elapsed time from actual time to net, adjusted time.